Perseveration is a medical term for a brain dysfunction which causes people to persist in a task even though they know rationally that the chosen strategy is doomed and may even be mortally dangerous. An analysis suggested that perseveration caused by an earlier head wound is what led German pilot Manfred von Richthofen, World War I's fabled "Red Baron," to chase a British pilot into enemy airspace on April 21, 1918, allowing aircraft and ground fire to cut his Fokker triplane to ribbons and kill him with a single bullet through the chest. Daniel Orme, a University of Missouri clinical psychologist, said, "He had target fixation and mental rigidity. He flew into a shooting gallery, violating all kinds of rules of flying — rules from the manual that he himself wrote." Orme, himself a retired Air Force clinician, reported his conclusions in a paper published in the journal Human Factors and Aerospace Safety. 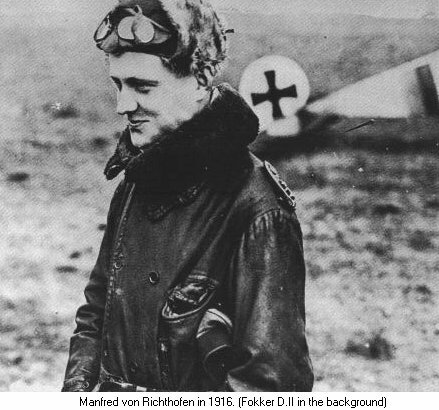 He described how Richthofen's behavior changed after a British bullet dug a four-inch groove in his skull during a dogfight nine months earlier. Orme says Richthofen (below) clearly suffered "traumatic brain injury." He brooded, behaved boorishly in public, and pulled childish stunts completely out of character for the careful pilot whose 80 kills eclipsed those of all other World War I pilots. "He had headaches, got sick when he flew, and suffered fatigue," Orme said. "Today the Air Force would have made him 'DNIF' — Duties Not to Include Flying." Alien Abduction Insurance — "Don't leave Earth without it"